Because it is important with maintaining Virtual Machine environments to be able to repeat routine tasks completely accurately, Windows PowerShell has grown in importance for the job. Now you can manage the Hyper-V environment via PowerShell without needing to use the Hyper-V Manager console. It opens up many opportunities for automation. Hyper-V manager: This is the default tool used to manage Hyper-V. This tool also manages remote hosts. It allows you to manage virtual machines, but also the network configuration and all Hyper-V settings. System Center Virtual Machine Manager: This tool is part of the Microsoft System Center products. VMM centrally manages one or more Hyper-V hosts. It provides advanced Hyper-V administration and you can also manage VMware hosts by integrating your VMware vCenter. Windows PowerShell: To simplify the management, it is possible to use the Hyper-V PowerShell module to configure and work with your virtual machines. With PowerShell, you can accomplish most of the tasks that you can accomplish with the GUI. 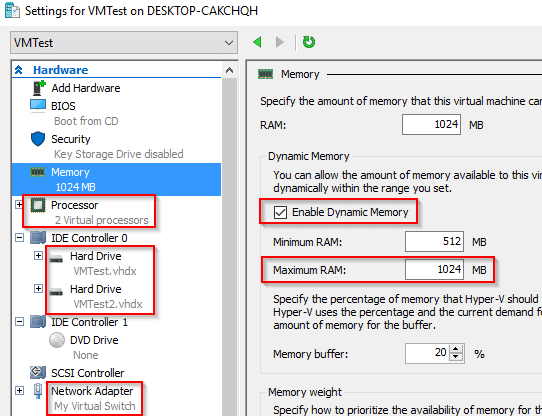 Why use PowerShell to manage Hyper-V? Of course, you can use the GUI to perform most of the actions that we will describe in this article. However, PowerShell has several advantages. It allows you to automate the tasks and gives you more flexibility. In some cases, you have no option to using PowerShell because Microsoft does not automatically include all the features of Hyper-V in the GUI. Make sure that you include the -IncludeManagementTools parameter. This will install the Hyper-V Manager console and the Windows PowerShell module for Hyper-V.
By Installing Hyper-V on Windows 10, you can use your own machine to test, and become familiar with, Hyper-V without any additional cost. All you need is a Windows machine with enough memory and processor to work comfortably. To make it easier to search for commands, pipe the output to the Out-GridView cmdlet. It also pays to update the help files before you begin with Hyper-V and PowerShell. Ok, let’s explore how you can automate many of your Hyper-V maintenance tasks with PowerShell. Most cmdlets do not display all the available properties. To change this, we must add the Select-Object cmdlet and then add the wildcard *. And finally, whether the live migration is enabled. This cmdlet accepts the -ComputerName parameter to query a remote host. Note that the virtual switches are not included in the previous result. To display them, you must use the Get-VMSwitch cmdlet. You will find that this command returns no result, which is normal. PS > New-VMSwitch -Name "My Virtual Switch" -NetAdapterName "Ethernet"
For help with the syntax of this cmdlet, use the Get-Help New-VMSwitch command. IntegrationServicesState: Allows you to verify whether the Integration Services are installed. For those using VMware, this is the equivalent of VMware Tools. State / Status / OperationalStatus: Several properties allow to precisely verify the health of the virtual machine. PS > Add-VMHardDiskDrive -VMName VMTest -Path "C:\users\Nicolas\Documents\Hyper-v\Virtual Hard Disks\VMTest2.vhdx"
Stopping the machine is done via the Stop-VM cmdlet. This action makes the machine stop through the operating system. For those using VMware, this is equivalent of the “Guest Shutdown” option. Stop-VM : The virtual machine is locked. An interactive shutdown cannot proceed while the virtual machine is locked. Note: the -TurnOff parameter can also be used. This is the equivalent of “PowerOff” via VMware. 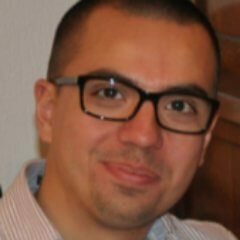 Let us finish by touching on the Hyper-V ‘checkpoints’ concept. Checkpoints are not considered as backups, but you will still find them to be very useful. Indeed, they are regularly used before performing an action on a VM such as an update, by saving the state of the virtual machine. In this way, it is very easy to roll back to the previous state if the update fails. The official term is “Checkpoint” but cmdlets also uses the term “Snapshot” that is well known to any VMware sysadmin. PS > Remove-VMCheckpoint -VMName VMTest -Name "Before Upgrade"
PS > Get-VM | Checkpoint-VM -SnapshotName "Weekly Checkpoint"
We have described the basic cmdlets to manage Hyper-V environment. PowerShell will help you to automate various repetitive tasks such as configuring Hyper-V in either a standalone host or Hyper-V cluster, provisioning a virtual machine or managing Checkpoints. Each example used in this guide can be applied in bulk mode to automate the management of your environment. 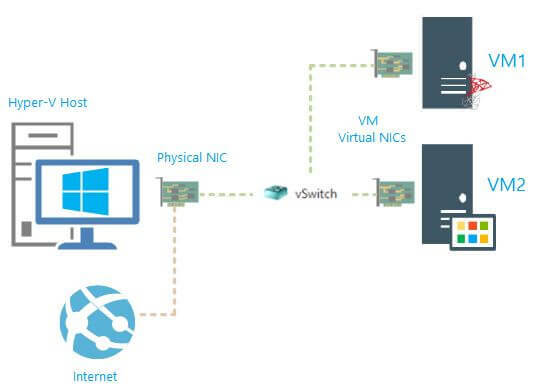 If you want to read more about working with Hyper-V using PowerShell, you can start with this article: https://technet.microsoft.com/en-us/library/hh848559.aspx. To learn more about a particular PowerShell command use, Get-Help. I found all of this very helpful; thanks. Thanks again for all the valuable information.